-We’re fun and your kids will love us…hopefully. Let’s start off with a simple question many ask – “Why does my child have to see a pediatric dentist, and not my regular dentist?” Well, we’re awesome, and that about sums it up. In all seriousness, there are many reasons to choose a specialist for your child’s care. Just as you choose a pediatrician for your child’s overall health care, you should choose a pediatric dentist for your child’s dental care. Children are not smaller versions of adults—they have different anatomy with different needs. Likewise, baby teeth are not just smaller version of adult teeth that can be treated the same way: they too have different anatomy that may require different treatment. A toddler’s diet is also different than an adult diet, and we can educate on customizing a plan for your child. Your child’s teeth are not just “baby teeth” that can be replaced by “adult teeth.” Caring for “baby teeth” has its own requirements, and they do not fall out until the ages of 5-12. Leaving issues unresolved or untreated until that time can cause significant issues. That’s why pediatric dentists complete additional, specialized training after dental school focused on issues specific to children’s oral care, including caring for those with special health care needs. Many pediatric dentists also receive additional training and/or work with trained dental anesthesiologists for complex sedation procedures. In a future blog post, we will provide additional details explaining the importance of early detection and early treatment. 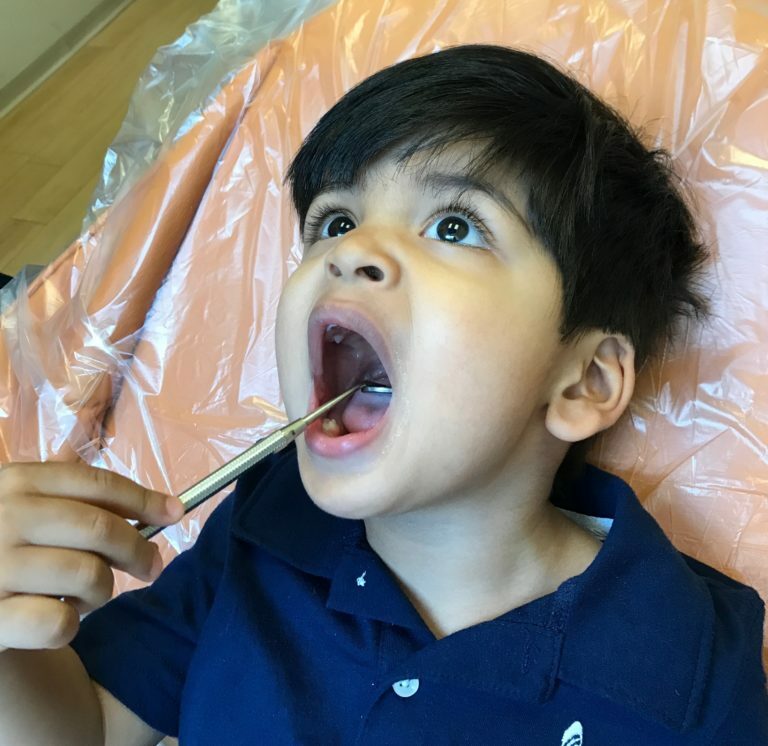 As pediatric dentists, our focus is not just on prevention and early detection, but also shaping a child’s perception of oral care and dental visits at an early age. Promotion of good brushing habits, diet, and positive visits to the dentist at a young age can help cement a healthy lifestyle for your child early on. Education is a key component of our practice as pediatric dentists. As parents, we’re expected to know everything about everything—but we don’t! That’s where we come in as pediatric dentists: we can educate on proper diet, brushing habits, timing of snacks, and other issues in an age-appropriate manner for your child. We can also provide guidance to parents regarding any changes that need to take place as your child grows older. Early detection can involve cavities, pathology, and orthodontics, just to name a few issues. Many also have questions regarding orthodontics (braces). Pediatric dentists believe in early intervention anywhere we can apply it! This includes orthodontics: every visit (whether we actively talk about it or not) involves keeping track of your child’s developing bite and any current or future red flags. This may include special x-rays that can allow us to track problems before it becomes too late. Some children can afford to wait until their late teens (or never!) to see an orthodontist, whereas others should have an evaluation much earlier (around 8-10 years of age) to resolve potential issues. Finally, we as pediatric dentists take the time to demonstrate details of the visit to your child to alleviate any anxiety. We try to build our office with the child in mind—colorful, non-threatening, and fun. Let’s be honest, a dental visit can be boring: there’s no one to talk to, and you can’t see what’s happening. So why not offer a TV above the dental chair for distraction? Even adults could benefit from this. We’re trained to work with children (through patience, distraction, and other techniques) to get the job done. But ultimately, we would rather get less work done if that means your child remains comfortable. If you’re still not sure about what’s best for your child, ask your friends with kids or parent groups; they can be a great resource and offer personal anecdotes on what worked for them. Please keep in mind that nothing above is meant to imply that a general dentist is not qualified to perform dentistry. They are simply not trained appropriately for comprehensive pediatric care, just as I am not properly trained for comprehensive adult care. Although we’ve all had experience with both kids and adults at some point, you have to consider the training and experience. Health care professionals should never be shy about hiding what is not under their realm of expertise, and this is the only way we can all provide the best care possible as a team! Dr. Sejal Patel is a board certified pediatric dentist at Tooth Works and a part-time attending faculty at Montefiore Medical Center. Confession: I have a major sweet tooth, chocolate is my weakness – but I believe that with moderation and prevention we can all have our cake and eat it too. I don’t like to sugar coat your child’s dental education, I believe that prevention is hard but doable, and I believe the dentist should not be scary.